The EON610 features built-in 1000 watt power amplification designed, as with all EON components to perfectly complement the performance of the drivers, delivering exceptional headroom with power to spare whether a fixed PA application or the demands of a gigging band. 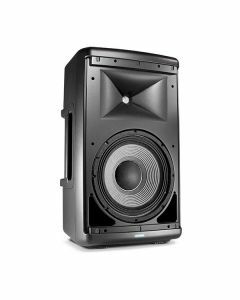 Driving the custom JBL high and low frequency transducers, the system provides massive sound pressure levels with lower distortion throughout the system’s full frequency range.. The JBL EON610 powered loudspeaker is highly adaptable and delivers premium quality in a portable package. Utilising JBL's advanced waveguide technology and the most modern advances in cabinet construction, acoustic science and transducer design, the EON610 outputs a studio-monitor-quality sound with performance suitable for nearly any live application. This powered speaker also features a 1000-watt amplifier to deliver exceptional headroom with power to spare, JBL waveguide technology that provides smooth, transparent sound, on-board EQ presets, Bluetooth integration and XLR loop through for routing signal to additional EON600-series speakers. Deploying the most up-to-date manufacturing materials and methods, JBL has calibrated the EON610's enclosure for optimum acoustic resonance. The end result is tremendous volume and outstanding performance in a convenient, lightweight package. Indexed feet moulded into the EON610 enable convenient storage and transport, on top of protected stacking for stage monitor and traditional stand-up configurations. Additionally, the intuitive location of the handles on the EON610 guarantee you'll have no trouble carrying it around, while integrated hardware mounts make it possible to fly with the EON610 if necessary. An examination of the EON610's radiation characteristics at different points on the high and low-frequency drivers enabled JBL engineers to discover a ground-breaking approach to waveguide design. The EON610 utilises standalone waveguides for each component that controls the sound radiation at the high frequencies, the crossover point, and at the low frequencies, ensuring unparalleled sound quality. Innovative design also provides consistent frequency response across the EON610’s entire coverage area, sending smooth, transparent sound to everyone in your audience. In order to provide sophisticated and convenient sound control, JBL developed an iOS and Android compatible Bluetooth interface for controlling volume and EQ parameters. Walk around the venue during soundcheck to experience the EON610's glossy highs, chest-thumping lows and bring out your smartphone or tablet to easily resolve any acoustic issues you may encounter.